When Atelier Pelpell's Céline Pelcé and Géraud Pellottiero designed an apartment in the center of Paris, they didn't have a single occupant in mind. The space was being converted into a vacation rental that could accommodate two to six people, so their design needed to be functional and suit a wide variety of tastes. 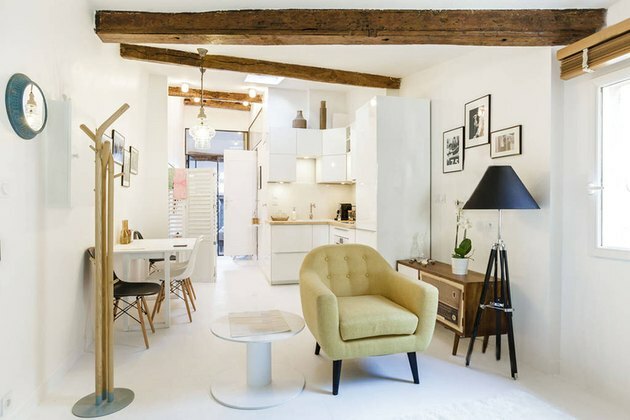 The apartment was on the top floor of a historic building near Centre Pompidou and measured just over 600-square-feet — not a lot to work with. 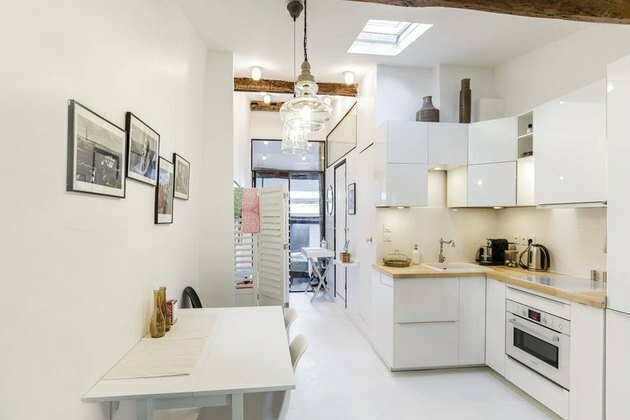 The architects wanted to play up the charm of the small space and mix contemporary style with a bit of Parisian spirit. 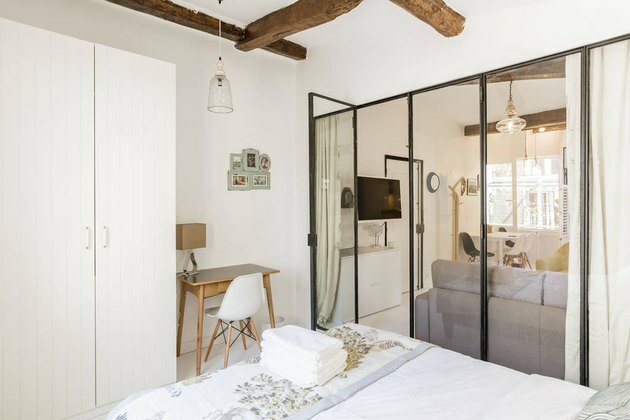 They focused on increasing the amount of natural light in the long, narrow space by opening up the layout and adding glass walls to separate the bedrooms (the apartment has two) from the public areas. Everything was painted in a crisp white, except for the beams, and the architects relied on furnishings to bring in color and personality. 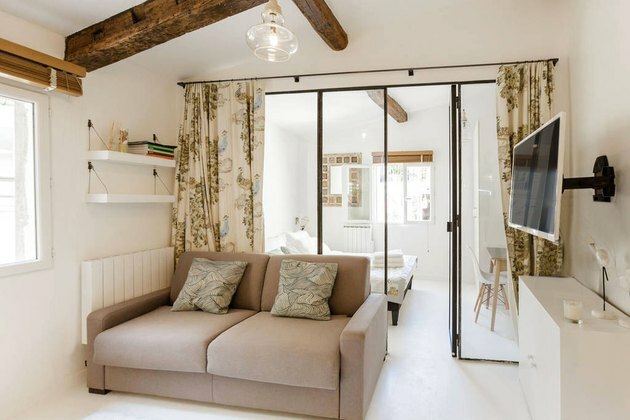 The finished product is a stylish escape that lives up to its charming location. 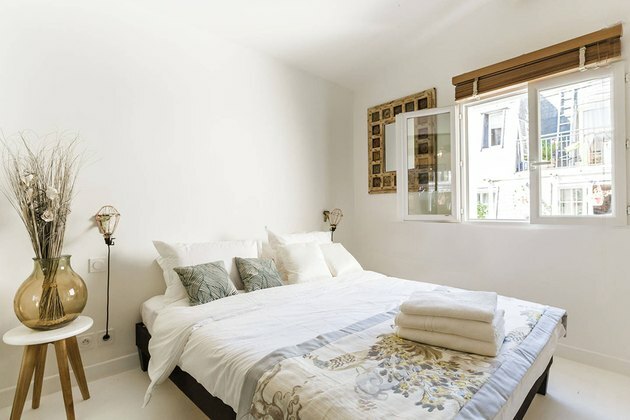 The walls and pine floors were painted in a crisp white to brighten the narrow space. The yellow armchair and tripod floor lamp, both by Made, add color and contrast. Glass walls allow light to flow into the main area. Curtains can be drawn for privacy. The sofa in the living area is convertible, adding room for extra guests. 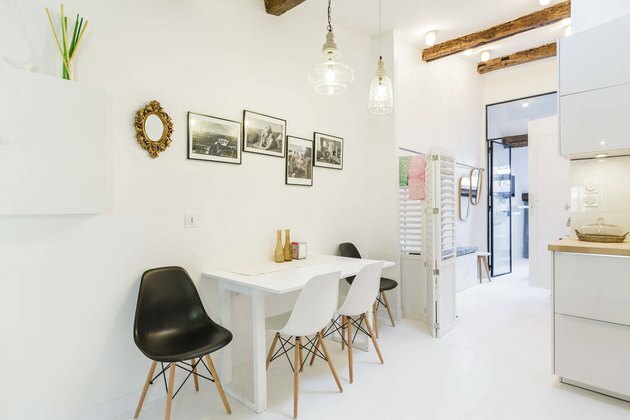 A small table can be pulled out from the wall to seat four using the black and white Eames chairs. Pendant lights by Vical Home illuminate the dining area and kitchen. Budget was a major consideration for this project, so the team chose a sleek yet cost conscious white Ikea kitchen in the apartment. Pelcé and Pellottiero kept the bedroom tranquil by limiting the furnishings and using a soft palette. 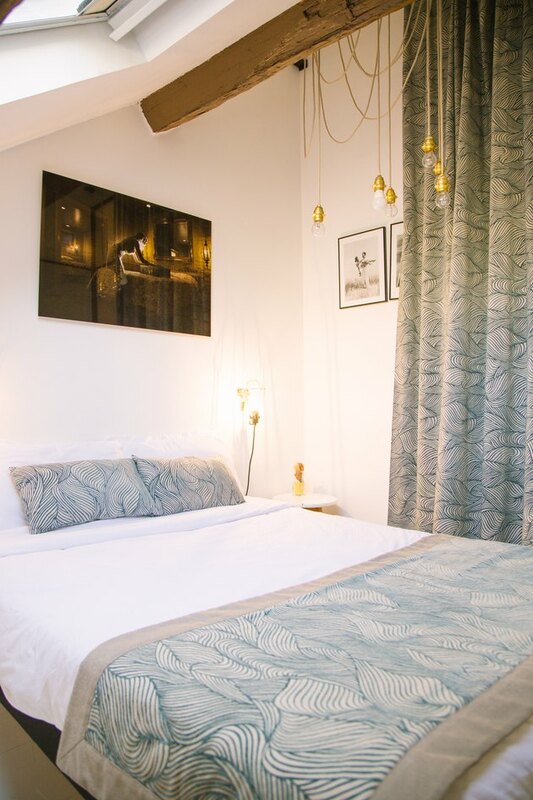 The bedcover was made with the same fabric used for the curtains. Lights by Merci were installed on either side of the bed. A small desk and Eames chair were placed beside a wardrobe. The beams throughout the apartment were left unpainted. Another bedroom was decorated using a fabric by Jane Churchill. The cascading pendant lights were designed by Atelier Pelpell. 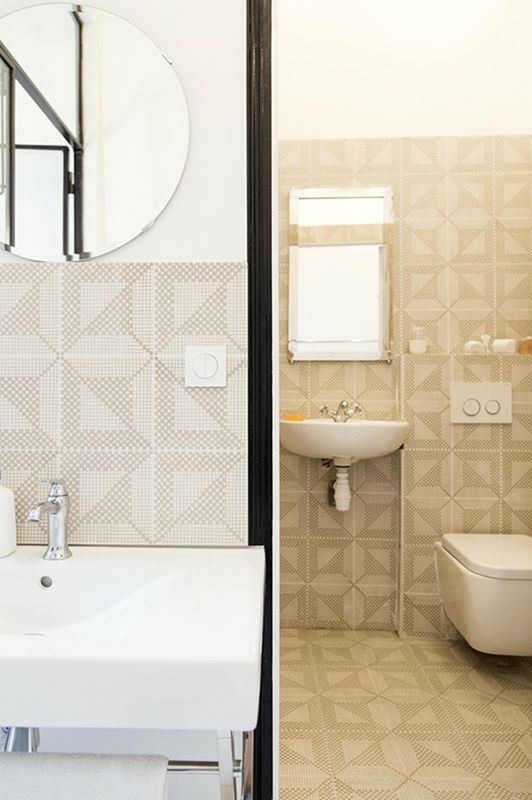 To keep the apartment as open as possible, the bathroom's sink and mirror were installed in the hall, reducing the bathroom to just a toilet and shower.